Jude's dreams of earthly happiness end where they began, on "The crest of the down by the Brown House, where the road to Alfredston crosses the old Ridgeway " (Ch. 49 in serial), at the very milestone on the back of which as a youth he had carved his name and destination to express his scholarly aspirations. Now, worn out physically and spiritually by his last parting from Sue in the new church at Marygreen, wasted by pneumonia, Jude "spread his blanket and lay down there to rest." 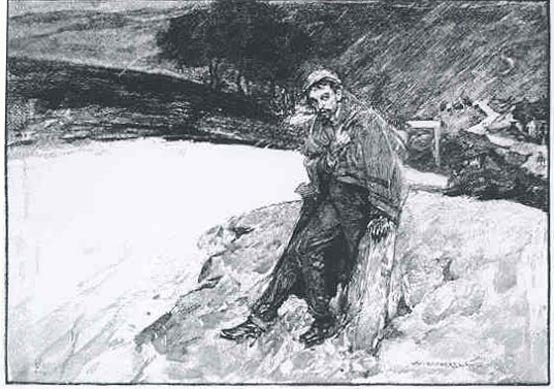 However, in Hatherell's final illustration Jude sits atop the milestone, his gaze penetrating the observer, as if remarking silently, "You too shall one day come to this state," as he huddles in his blanket to keep off the rain driven upon his head, back, and shoulders by the north-east wind. Hardy's commenting that Jude looks at the building that once housed Sue, "knowing his eyes would light on that scene no more," implies that Jude has realised that he is dying, but he does not expire from this misadventure for some months. The Impressionistic artist of the fin de siècle has given us a minimal background that is a far cry from the patient detailism of Hardy's early illustrators, especially Helen Paterson Allingham and George Du Maurier. The impending darkness, contrasting with the utter white of the road, mirrors Jude's internal bleakness. The swaying clump of black trees (upstage centre), the staccato of rain slicing across the picture diagonally, the finger post in the background pointing at Jude, and the zigzagging road right rear contribute to the overall power of the composition to convey Jude's prostration resulting from Sue's ultimate rejection of him. Allow me to express my sincere admiration for the illustration of "Jude at the Milestone." The picture is a tragedy in itself; and I do not remember ever before having an artist who grasped a situation so thoroughly. In response to a request from the author for a copy or photographic reproduction of this final illustration Hatherell presented Hardy with a complete set of the twelve Harper New Monthly Magazine plates, which the great Wessex-wordsmith had framed and hung above the mantlepiece in his study, transferred in every detail after his death in 1928 to the second floor of the Dorset County Museum in Dorchester.